An ESF scientist is part of a research team that has discovered there are two species of giant tortoises - not just one, as had been long believed - living on the island of Santa Cruz in the center of the Galapagos Archipelago. The discovery of the new species, detailed in a study reported today (Oct. 21) in the journal "PLOS ONE," is likely to help focus attention on the newly named Eastern Santa Cruz Tortoise (Chelonoidis donfaustoi), said Dr. James Gibbs, an ESF conservation biologist who has worked extensively with tortoises in the Galapagos. His work on this discovery and others has been done in collaboration with the Galapagos National Park Service, Yale University and the Galapagos Conservancy. Gibbs also participated in the first research expeditions to explore the new species' range. "This is a small and isolated group of tortoises that never attracted much attention from biologists previously," Gibbs said. "But we now know that they are as distinct as any species of tortoise in the archipelago. Their discovery and formal description will help these tortoises receive the scientific and management attention they need to fully recover." The discovery also calls attention to a longtime Galapagos National Park ranger who spent decades developing methods still used today for breeding endangered tortoises. His name is Fausto Llerena Sánchez, known to his friends and colleagues as Don Fausto. The new species' Latin name was chosen in his honor. Don Fausto dedicated 43 years (1971-2014) to giant tortoise conservation as a park ranger for the Galapagos National Park Directorate. He was the primary caretaker at the Tortoise Breeding and Rearing Center on Santa Cruz, which now bears his name. 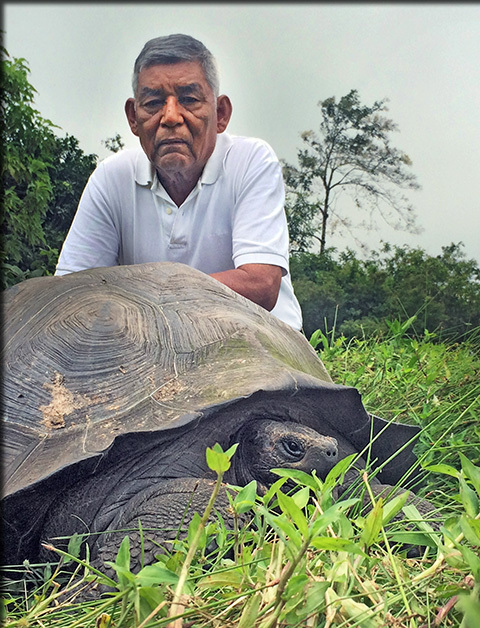 The restoration of several tortoise populations is due in part to Don Fausto's dedication and efforts. "It's to honor Don Fausto for all his dedication and hard work," Gibbs said. "He devoted his life to saving many critically endangered tortoises through captive breeding. It isn't easy to breed tortoises in captivity. He didn't have many resources or much guidance. He figured it out through patient observation, great creativity and intelligence, and tremendous resourcefulness." Gibbs said Don Fausto successfully bred tortoises in Galapagos while many of the best zoos around the world have failed in their efforts to do so. "I recall many times seeing Don Fausto early on a Sunday morning, when most everybody else was still asleep, riding his bike to the captive rearing center to tend to the tortoises," Gibbs said. "His dedication to his work has been inspirational." "Naming a new Galapagos tortoise species is of great importance for Galapagos," said Alejandra Ordoñez, director of the Galapagos National Park. "We are thrilled that it was named in honor of the longest-working park ranger in the history of Ecuador and Galapagos." There are two populations of giant tortoises on the island. One very large population is on the west side in an area known as the "Reserve" and the other is on the lower eastern slopes around the hill named "Cerro Fatal." Until the recent discovery, researchers believed that these populations belonged to the same species of tortoise. Genetic and morphological analyses conducted by an international group led by Dr. Gisella Caccone of Yale University have now clearly identified the two populations as separate species: the Western Santa Cruz Tortoise (Chelonoidis porteri) and the new Eastern Santa Cruz Tortoise. While the Western Santa Cruz Tortoise population has a few thousand individuals, the new species' population numbers are only in the hundreds. Its distribution, nesting zones, population numbers, and potential threats are not well known. "The naming of this new species will allow for increasing efforts to protect and restore the population," said Caccone. "The low numbers, limited geographic range, and reduced genetic diversity make it vulnerable. As a new species, it will now receive the attention that it needs to ensure its survival." Giant tortoises have been among the most devastated of all Galapagos creatures because of human exploitation over the centuries, introduced species and habitat degradation. The Giant Tortoise Restoration Initiative, a collaborative project of the Galapagos National Park Directorate, Galapagos Conservancy, Caccone's group at Yale University and others, is focused on the long-term restoration of all Galapagos tortoise populations to historical numbers. Special emphasis will now be placed on the Eastern Santa Cruz Tortoise. "This is an exciting moment in the history of Galapagos giant tortoises," said Dr. Linda Cayot, science adviser for Galapagos Conservancy. "Over the last several years, the ever-growing role of genetics in developing conservation strategies for Galapagos tortoises continually requires us to think in new ways." The Yale University Office of Public Affairs and Communications, the Galapagos National Park Directorate and the Galapagos Conservancy contributed to this report.